[Mahesh Venkitachalam] wanted to light up the dark recesses of his desk. What good is all that storage if you can’t see a darn thing in there? His solution was to add LED strips which turn on automatically when the door is opened. The design is quite simple. A 2N2222 NPN transistor is responsible for connecting the ground rail of the LED strips mounted under each shelf. The base of that transistor is held high with a pull-up resistor. But a reed switch always connects the base to ground when the door is shut. Opening the door removes the magnet that keeps that reed switch closed. This allows current to flow from the pull-up to the base, connecting the ground rail to the LED strips and turning them on. You can see the video demo after the break. One problem that we see with the design is that these are driven by a 9V battery. Over a long period of time that pull-up resistor will drain the cell. You can pick up a magnetic reed switch at the hardware or electronics store that is rated for 500 mA. If you can stay under that with the LED strips, and get one that is open when the magnet is present you will have zero power drain when the lights aren’t being used. [Steven Mackaay] added a simple user interface that implements a shutoff timer for his desk lamp. His project log comes in two parts, the breadboarding and the actual implementation. He wanted a few things out of the build. The first is an LED that would help him find the lamp in the dark. The second feature is a shutoff timer with different delay options. To get everything working he used a PIC microcontroller to drive a mechanical relay. That relay switches the mains power to the lamps. Now he uses one button to switch the lamp on and off. The other selects a shutoff timer of one, five, or thirty minutes. Power for the control circuitry is provided by the green wall wart PCB seen in the photo of the electronic guts. This is a pretty general setup that could be applied to a lot of other mains switching applications. Just connect the logic hardware to some type of relay. A group of researchers have figured out how to produce graphene using a DVD drive. This discovery helps clear the path for mass production of the substance, which was discovered in the late 1980’s. More recently, the 2010 Nobel Prize for Physics was awarded to a team that produced two-dimensional graphene; a substance one just atom thick. One method of doing so used Scotch tape and is mentioned in the video after the break as a technique that works but is not feasible for large-scale production. The process seen here starts with graphite oxide because it can be suspended in water. This allows a lab technician to evenly distribute the substance on a plastic surface. Note the use of optical discs. The second part of the process involves hitting the dried layer of graphite oxide with a laser. It just so happens that this can be done with a consumer DVD drive. The result is graphene that can be used in circuits and may have potential as a fantastic super-capacitor. Over on the Parts People blog, [Nathan] created his own Raspberry Pi laptop. It’s got all the bells and whistles, including a keyboard, trackpad, battery, and even a 3D printed case. Of course [Nathan]’s laptop contains a Raspi, but the other included parts are where this palmtop computer is turned into something useful. For powering the Pi and 3.5″ composite LCD, [Nathan] took apart the battery pack from an old Dell laptop. By throwing out the bits of plastic surrounding these rechargeable cells and reusing the battery connector, [Nathan] was able to power the Pi, and all the peripherals for 10 hours. As the year draws to a close, we must look back and look at the advances in amateur radio this year. The RTL-SDR tuner hack, a USB TV Tuner to create a software defined radio receiver, is one of the greatest hacks of the last 12 months and a great justification for 2012 being the year of software defined radio receivers. 2013 is shaping up to have even more advances in the state of software defined radio. This time we’ll be transmitting as well, possibly with [AE9RB]’s Peaberry SDR transceiver. 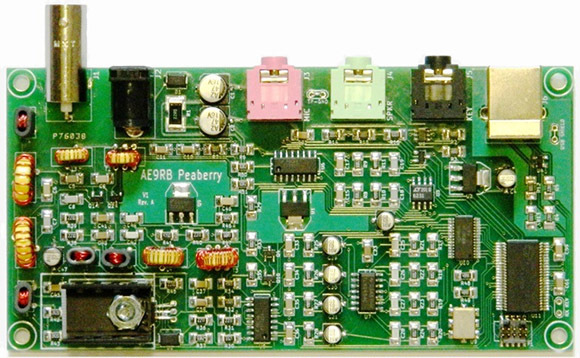 The Peaberry SDR transceiver is a kit to both transmit and receive on every HAM band between 160 meters (1.8 MHz) to 17 meters (18 MHz). It does this through a USB interface and a 48kHz, 24-bit interface that is (or will shortly be) compatible with all the major SDR interfaces. While the Peaberry SDR requires an amateur radio license to operate, we can’t wait to see what else will be coming to the software defined radio scene in the next year. Thanks [Zach] for sending this one in.